Why are so many disabled roles played by non-disabled actors? 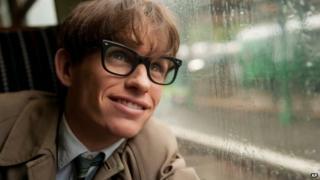 Eddie Redmayne has been nominated for an Oscar for his portrayal of Stephen Hawking in A Theory of Everything, but should the role have been played by a disabled actor? It's become almost a running joke that if you want to win an Oscar, play a disabled character. Daniel Day-Lewis took the award in 1989 for his portrayal of Christy Brown, an Irish writer born with cerebral palsy, in My Left Foot, and the year before Dustin Hoffmann scooped best actor for his role in Rain Man playing an autistic man with the ability to count hundreds of objects at once. It's even been suggested by film critics that playing a disabled character is a sure-fire way to secure at least a nomination, and probably a win. Sixteen percent of all the best actor and actress awards have been portrayals of disability or mental illness, after all. But some disability campaigners question why these roles are not given to people with disabilities or mental illness, who - they say - could portray the nuances of living with such conditions more accurately. In a recent Guardian article Frances Ryan said that "while 'blacking up' is rightly now greeted with outrage, 'cripping up' is still greeted with awards". She asked whether there was actually much difference between the two, arguing that in both cases actors use prosthetics or props to alter their appearance to fit the role and perpetuate under-representation in the industry. RJ Mitte, who played Walter White Jr in Breaking Bad, and has cerebral palsy, said in an interview with BBC Newsnight that nobody should be denied the chance to play a disabled role. "The issue it comes down to," he says, "is an accurate and honest portrayal of what that disability means to so many millions of people." So did Redmayne achieve this portrayal of life with motor neurone disease (MND)? Sarah Ezekiel, who has MND says he did. "I still can't believe how well he played the part," she says. "I never thought that an actor could replicate what MND does to the body, but he did it perfectly." In the film, Redmayne has to convey the transition from non-disabled to disabled. Because of this, some have argued he is perfectly placed to play the role - a disabled actor, the argument goes, could not have played Hawking before he got MND. But for Hollywood Reporter film critic Leslie Felperin, the issue is a deeper one about identity politics. She says there has been understandable disgruntlement across the years with white actors playing black roles, but that has moved on to become an embarrassment and not acceptable: "If they were making Gandhi now, they wouldn't cast Ben Kingsley, they would find an Indian actor." For her it would be more authentic to have a disabled actor playing a disabled role. But in some cases, is it feasible? An actor with the same level of disability as Raymond Babbitt in Rain Man would not have been able to play the role. Mitte is a good example of somebody who managed to break the mould and play a character who has the same disability as himself. However his personal form of cerebral palsy is not as pronounced as his character's. There was still individual interpretation, and a director's vision involved - part of the acting process for all actors, disabled or not. The problem, says playwright Christopher Shinn, is that there are an incredibly limited pool of disabled actors who are big box-office draws, and not having a recognisable name in your cast is nothing short of making a doomed film. But why is there such a small pool? The numbers of disabled parts are smaller than the number of disabled actors so competition is rife. Film critic Callum Madge also argues that a key reason why disabled actors don't get cast is because the industry is a shallow one, with directors regularly choosing not to cast someone because of their height, build, hair colour or any other feature they don't want in their production. If the top roles playing disabled characters are going to non-disabled actors, whatever the reasons behind that decision, it is restricting the opportunities for disabled actors, says blind film critic Tommy Edison. The onus is put onto disabled people to push past the criticism dealt to them, perhaps unfairly, in the industry, he says. For Mitte this is just part of the course. "It's hard to get a role in this industry no matter what, disabled or non-disabled, there's always someone better looking or with a better disability," he says. "What it comes down to is confidence, when you have people with disabilities they don't normally have a lot of confidence." A selection of your comments about this article, taken from Twitter. Richard Ashton: "Yes! Only Gay actors for gay roles, no young actors to play older, no thin to play fat and only dead play those deceased." HarryBojangle: "Let's put it this way, who's playing the new Annie and who's playing Egyptians? Etc etc. I think you have your answer." Dannette T: "Yes. Otherwise it looks like a pisstake." TheEntitled Gamer: "Should people with real mental illness play parts in Shakespeare tragedies? ... Where do u draw the line? Is it ok for non soldiers to play soldiers in films? Is it ok for adults to voice the parts of children?" D posted: "Why are so many disabled roles played by non-disabled actors? Because it's acting. Get over it." GeorgiEvans-Phillips: "The role wasn't disabled throughout. A disabled actor may have found the beginning of the movie too challenging."